Probably the most successful reality show in Hindi television, Bigg Boss is hosted by Bollywood Superstar Salman Khan. The man with his wit and charms has hosted the show from its fourth season till date. Bigg Boss Hindi version was the first version of the Bigg Brother reality show in India which was originally commenced in the Netherlands. Began in 2006-07, Bigg Boss season 1 was hosted by Arshad Warsi during which the prize money was Rs 1 crore. Subsequently, the show was hosted by Shilpa Shetty, Amitabh Bachchan, Salman Khan, Salman Khan and Sanjay Dutt and then Salman Khan alone. Atul Kapoor was the voice of Bigg Boss since the first season. The show has completed 11 seasons till date and the 12th season is going to commence on 16th of September 2018. The theme of this season is said to be Vichitra Jodi and the season will comprise 14 contestants. While the list of candidates that are going to participate in Bigg Boss season 12 is not confirmed some names have leaked to the media out of which the names of comedienne Bharti Singh and her husband Haarsh Limbaachiyaa seem to have confirmed. The names of Ghazal Singer Anup Jalota and Television actress Dipika Kakar were also confirmed. Another Jodi of a lawyer- Romil Choudhary and a police officer Nirmal Singh were also said to be confirmed. Other names like Cricketer Sreesanth, Actress Tanushree Dutta, Television actor Karanvir Bohra, Actresses- Shristy Rode, & Neha Pendse, VJ/ Model Scarlett Rose are also circulating in the media as most likely contestants. Bigg Boss has always been organized at a specially built house at Lonavala, Mumbai. The show is going to start on 16th September 2018 and will be telecast at 09:00 PM every day, even on weekends. 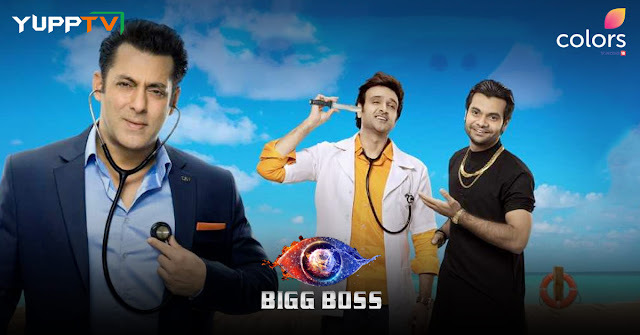 Watch Bigg Boss season 12 on Colors TV Live through YuppTV from the available regions. One can even access the show on Smartphones, Smart Televisions, Gaming consoles etc., using YuppTV App.